Durban – Never mind their fearsome jaws. People are now more likely to be killed by eating shark meat rather than the other way round. This was the warning from researchers at the Sharks International Conference in Durban, where several new studies showed increasing levels of chemical poison and toxic metals in shark meat when a growing number of the animals are targeted for human consumption. In her presentation “Sharks may kill you… if you eat them”, Jann Gilbert of Southern Cross University in Australia said recent meat samples from at least three species of shark had levels of arsenic, mercury and other toxic compounds way above the recommended food safety levels. Gilbert said up to 273 million sharks were killed every year around the world. 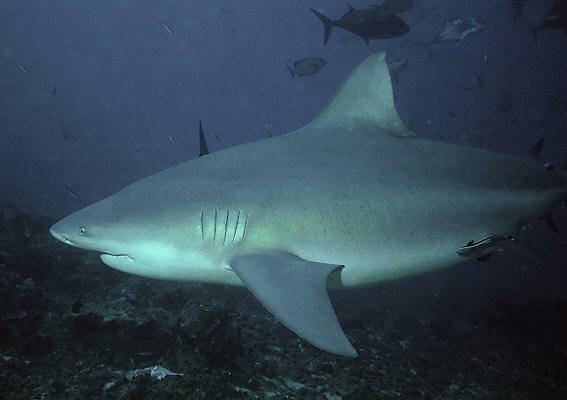 While a large percentage were destined for the shark fin soup market, shark meat was also used widely for direct human consumption or indirectly in fish meal or fertiliser. Gilbert’s study was based on toxic metals in dusky, sandbar and great white sharks in south-eastern Australia. For instance, mercury levels in two of these predator species were 10 times higher than safety levels recommended by the Foods Standards Authority of Australia and New Zealand. Arsenic pollution was also high, with some sharks containing arsenic concentrations significantly higher than safety recommendations. Very high levels of arsenic had also been found in hammerhead sharks in the Mediterranean sea in a separate study. Gilbert said her results were comparable to many other studies from around the world, which indicated that shark meat was becoming increasingly toxic and unsafe for human consumption. While it was difficult to provide an exact guideline on safe levels for those who consumed the meat regularly, she suggested that most sharks more than 150cm long were “not likely” to be safe for consumption. Because high mercury levels could damage the brains of developing human babies in the womb, Gilbert would not advise pregnant women to eat shark meat more than once a fortnight. Kady Lyons, of the University of Calgary, said that apex predators such as sharks were prone to bio-accumulating and bio-magnifying man-made chemical poisons because they were at the top of the food chain, especially if they fed along the coast next to large cities and farming areas. Some of these toxic chemicals, including DDT and polychlorinated biphenyls (PCBs), were also being passed on to young sharks from the fatty tissues of their mothers. Daniel Fernando, a marine biologist from Linnaeus University in Sweden, told the Durban conference that a study of manta rays and other shark-like species in Sri Lanka and China showed high concentrations of mercury and other toxic substances were above international recommendations for human consumption. The chemicals they found came from a wide variety of human sources, such as wood preservatives, marine anti-fouling agents or insecticides. In his keynote speech, Dr David Ebert of the Pacific Shark Research Centre in California, said sharks continued to conjure up images of large and fearsome predators with a large dorsal fin cutting through the surface of the sea.